Preheat the oven to 190°C, gas mark 5. Rub a few drops of the oil into the skins of the potatoes. Season, then place on a baking sheet and bake for 40-45 minutes. Check they are cooked by piercing with the tip of a sharp knife. Meanwhile, heat the remaining oil in a large frying pan and add the garlic and chilli powder. Cook gently for a minute or so without letting the garlic brown. Add the leeks and cook over a medium heat, stirring occasionally, for 10-12 minutes or until just tender. Season with freshly ground black pepper and set aside. Preheat the grill to high. 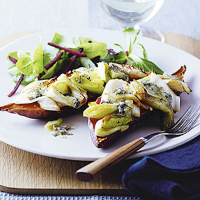 Cut the sweet potatoes in half lengthways and place them, cut-side up, on a baking tray lined with foil. Spoon the leek mixture over the potatoes and top with the Stilton. Place under the grill for 2-3 minutes, until the cheese has just started to melt. Serve with Waitrose Beetroot Salad. To reduce the cooking time, pierce the potatoes and place on a microwaveable plate. Microwave on high power for 10 minutes, then cook for a further 20 minutes in the oven to crisp the skins.